A solidly-built full-forward from the Paramount Football Club at Fawkner in Melbourne’s north, Doug Baird spent three years with Carlton’s Under 19 and Reserves teams between 1966 and 1969, before he was given an opportunity at senior level. But at a time when the Blues were building a great player list – a line-up of stars that brought three flags in six years - Doug was relegated to cameo roles as Carlton’s third-choice spearhead. As such, he managed just six games and eight goals over two seasons in guernsey number 27. 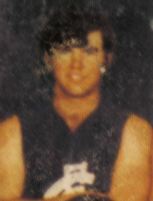 Baird won the VFL Under-19 goal-kicking award in 1968 (in a tie with Richmond’s David Droscher) and by early in the following season was continuing to impress with the Blues’ Reserves side. Doug’s problem was that as a specialist full-forward, he was ranked third at the club behind champion Alex Jesaulenko, and rugged left-footer Ricky McLean. Eventually however, injury to both his peers paved the way for Baird’s elevation to senior level in round 10, 1969, when Carlton met North Melbourne at Arden Street on the Monday of the Queen’s birthday long weekend. Doug kicked two goals on debut in a comfortable 21-point victory by the ‘Baggers, only to be omitted from the side for the next match when Jesaulenko was passed fit to return. Thereafter, Baird warmed the bench as a reserve in three of his next four games spaced between rounds 12 to 18. He wasn’t included in any of Carlton’s finals line-ups, and ended his first season with a return of 8.6 from five senior appearances. In 1970 he found it even harder to earn a senior place, but was rewarded for his consistent efforts with the seconds when he was recalled as 20th man for the round 22 match against Melbourne. On an historic occasion for the Carlton Football Club, ‘Jezza’ kicked his 100th goal for the season late in the final term, and the Blues tuned up for the finals with a win by 14 points. Baird, Wes Lofts, Dennis Munari and Ian Nicoll were all sent off as winners in their last game for the club that afternoon, as the Blues prepared for the miracle to come in the 1970 Grand Final. After he and Carlton parted company, Doug embarked on a long and varied football journey that eventually stretched over another sixteen years. First, he headed to VFA club Prahran, before switching to Brunswick in 1972 to give the Association Magpies a real target up front. He was the leading goal-kicker in the VFA 2nd Division in 1973 with 94 majors, and in 1974 did even better without topping the list. He kicked 98 goals that year, but finished runner-up to Coburg's Peter Smith, who dobbed 121. In 1975, he again fell short of the century with 95 goals, but still won Brunswick's Best and Fairest in a Premiership year. Overall, Baird gave Brunswick sterling service by kicking 310 goals in 66 matches over three seasons, at the astounding average of 4.69 goals per game. In 1976 Doug crossed Bass Strait to spend the next ten years in Tasmania. He played and coached 130 games with the Cooee Bulldogs, before later coaching nearby Ulverstone. In 1985 he came back to Melbourne, and was talked into taking over the reins at Essendon and District Football League club Tullamarine by his former Carlton team-mate Garry Crane. Season 1986 saw Baird back in the VFA with Northcote, who were unfortunately a shadow of the dominant force they once had been, and were languishing in Second Division. Doug pulled his boots on for a few games, but at 36 years of age his best days were behind him. So he wisely retired and invested time into the youth of the club. Alas, that wasn’t enough to save the Dragons, and in 1987 they folded – ending 79 years of suburban football history. Baird also wore numbers 51 and 40 (in 1967) and number 41 (in 1966) when he played with Carlton's Reserves team. In a tragic moment for the Carlton Football Club and the nation as a whole, Doug’s beloved son Cameron became the 40th Australian soldier to die in the service of his country in Afghanistan when he was killed in action in June, 2013. A career soldier and a member of the elite 2nd Commando Regiment, Corporal Baird was on his fifth tour of duty in Afghanistan, having also served in Iraq and East Timor. In 2007, he had been awarded the Medal for Gallantry after he braved enemy machine gun fire to rescue a fallen comrade. In breaking the news to the nation, Chief of the Defence Force, General David Hurley, described Corporal Baird this way; “In combat and as a team commander, he was the man to watch, and never happier than when the situation demanded decisive action and courage”. Through his grief, Doug Baird took time to say that he and his remaining family were deeply appreciative of everyone’s kind thoughts. “All I can do is thank the people at Carlton from the bottom of my heart,” Doug said. “I thank the players past and present, and everybody connected with the organisation for their thoughts. We’re still Blues supporters, and Cameron was a dinky-di Blue as well." On Thursday, February 13, 2014, Prime Minister Tony Abbott rose in Parliament to announce that Corporal Baird had been posthumously awarded the nation's highest honour for bravery; the Victoria Cross, for his actions on the day he was killed. Cameron had been shot dead during a battle to take an insurgent-held compound in the village of Ghawchak, in Afghanistan's Khod Valley, on June 22, 2013. During the fire-fight, he repeatedly drew fire on himself to give his team members the chance to gain ground. "Corporal Baird led an assault on an enemy-held compound," Mr Abbott told Parliament. "On three separate occasions, under heavy fire, he forced the door of a building. Twice he was forced to withdraw to re-load and then to clear his rifle. For the third time, he entered the building. Again drawing fire away from his comrades who were able to secure the objective. Tragically, he was killed in this final assault. Words can hardly do justice to the chaos, confusion and courage that were evident that day. As the citation reads, his Victoria Cross is for most conspicuous acts of valour, extreme devotion to duty, and ultimate self-sacrifice... as a commando team leader." Speaking after the announcement in Parliament, Corporal Baird's brother Brendan described it as a "proud day" for the family. "Cameron never liked the limelight," he said. "He was a very humble man who would not see this as an individual award, but a recognition of all at 2 Commando. We will accept this award not only on behalf of Cameron, but for all his brothers, his team, his company and his regiment." Contributors to this page: PatsFitztrick , Bombasheldon , blueycarlton , molsey , tmd1 , p(12)terg , dgreen2 , WillowBlue , true_blue24 , Juzz and admin . Page last modified on Thursday 13 of February, 2014 23:03:02 AEDT by PatsFitztrick. 2003 - Optus pulls plug on Princes Park (1/9/03). 1971 Rd 7 - Match Review Vs Footscray.